Great, they store well dried. Hi Scott and thank you for your comment! That sounds like a great way to dry a bunch of mushrooms.I will give a try! 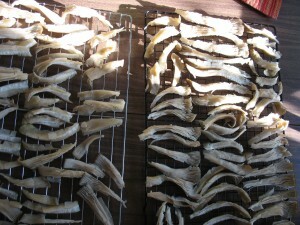 would you be able to tell me what dried oyster mushrooms can be used for apart from food industry? Hello Shaguna, and welcome to Montana Mushrooms! The only other use that I know of is to reduce cholesterol.It has the same chemical in it as Lipitor. I don’t know of anyone using it for this except me, and I am just eating them. Found your site after having a tremendous hunt today. I was wondering, I have an old screen that is 3′ x 4′, could I set the screen on saw horses and dry them in the sun? Do I put paper towels over or on top of? Hi Kym, and welcome to Montana Mushrooms! 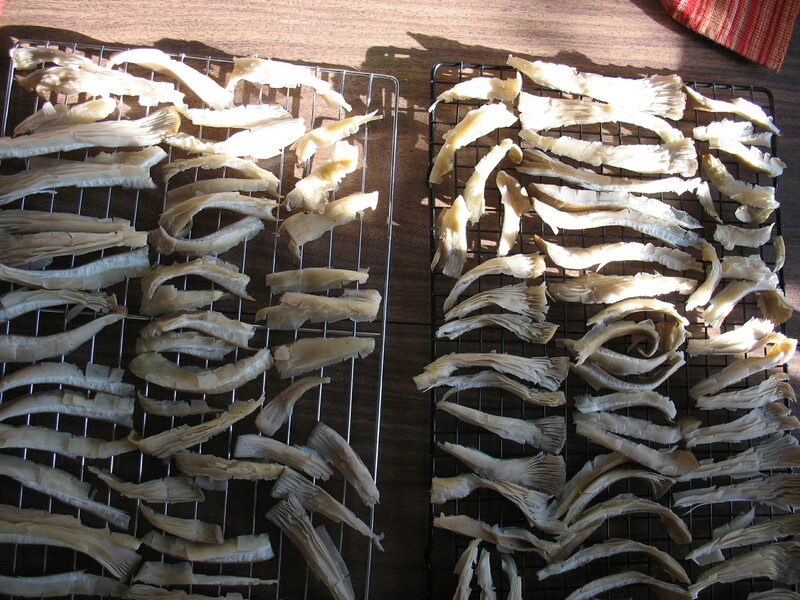 You can dry mushrooms on a screen in the sun. I prefer the dehydrator because it is more consistent. Just remember when drying mushrooms, air circulation is much more important than heat. Some will say that the sun will remove the nutrients and others will say that it adds vitamin A to them. Whatever it takes to get them dry quickly because thw worms just love oyster mushrooms! Thanks for the great info… The oysters are really going off right now. What’s your favorite recipe? My favorite oyster recipe is to lightly oil small oysters and grill them until the edges turn light brown. A little tamari and seasoning on the gills and you have a simple, tasty meal. There are so many ways to cook oysters…it is a very under appreciated mushroom! Oyster mushrooms can be dried whole or pulled apart in chunks. I also saute them and freeze them in zip lock bags. I am not familiar with vacuum packing and freezing. Let us know how they turn out! 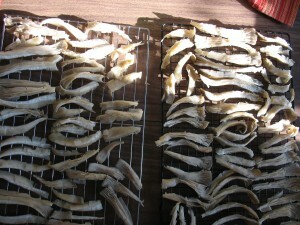 Please tell me the dried mushrooms how long can you store them and can you put them in sealed plastic bags for storage? 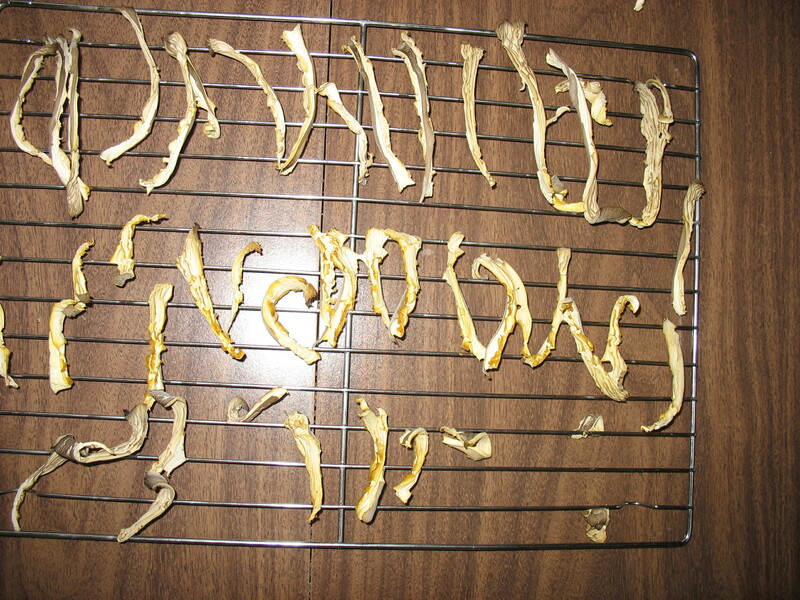 I have stored dried mushrooms for years. They have to be completely dry to be safe. Yes, sealed bags are okay for storage. I prefer glass whenever possible. Great resource, found on the first try! 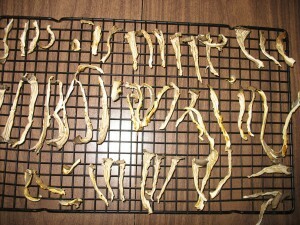 I dehydrated a batch of oysters today, whole, I only trimmed part of the stem. When done I noticed some fuzz along the stem. Is the whole batch ruined or am I ok to tear off the remaining stems? Hello, and thank you for the compliment! I am thinking that if the fuzz is white, it is probably mycelium and harmless. Either way, you will be safe to lop the stems off and enjoy the caps. 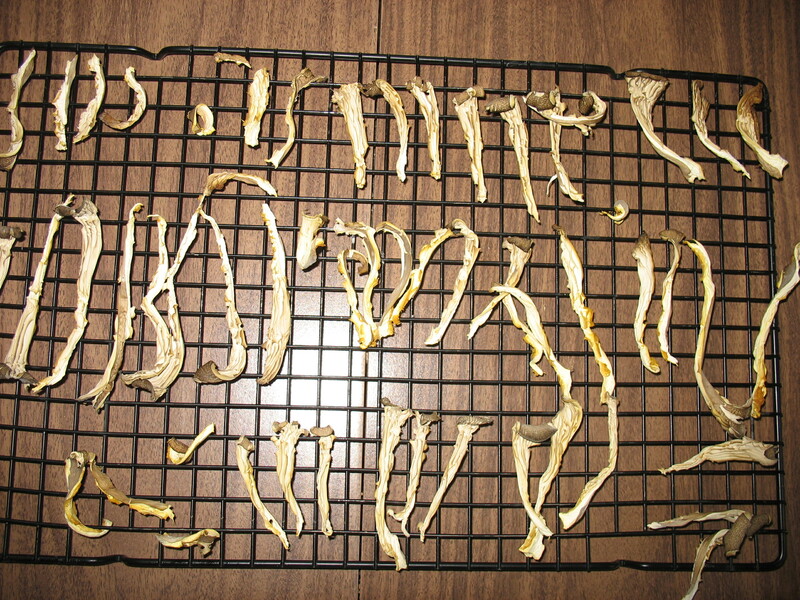 Hi, dehydrating a batch right now ! Thanks for the genius suggestion of tearing instead of cutting! Wondering if there is a use for the stems? I tear shiitakes and other gilled mushrooms also. I grind the stems and use them in gravy, soup and broths. They are so good for us that I can’t throw them away. 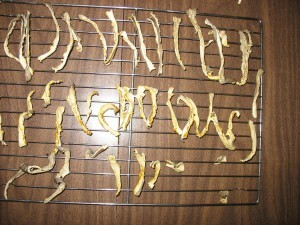 What temperature should I dry oyster mushrooms in dehydrator? My temp can go as low as 95. I understand heat takes away flavor. Thank you for your help. If you dry them completely, they will be fine store anywhere. Hi, I have a whole kit of oyster mushrooms that have really taken off – though now I am nervous about eating them as there is a caution section in the paper about bad or aborted mushrooms. Is there a picture that I can send of the mushrooms so that you can tell me if these are okay to eat/store? I’d hate to get rid of them due to my lack of knowledge and slight nervousness. My crimini & shitake kits came out great – but these ones are new to me. I really like the information you have provided on your website! I’m a mushroom enthusiast in Montana as well. I was going to attempt to dry some of mushrooms I find. I have purchased frozen oysters. I noticed that others mentioned cooking and then freezing. I was just going to test out freezing some without cooking them and seeing how they turn out. Any words of wisdom on this approach?